Sometimes when traveling I know I need to be in a specific city on a specific day. In this case, my go-to travel website is Kayak, typically with a sanity check against the ITA travel matrix. However, more often than not, when trip planning my first question is “Where should I go?” My travel philosophy is that there's so much to see in the world, I might as well go and see it when I can get a good deal. So when I'm planning a trip where I've got nowhere specific to be, my goal is to find the best deals on flights, busses, and trains, and these are my go-to travel websites to do so. I always start here. The best feature of Skyscanner is their fly “everywhere” feature. You pick your departure city, the dates (or if you're getting really crazy, you can scan the whole month), and see what cities are cheapest to get to. If you're itching to go soon, check it out now and see how cheaply you can get out of town. You'll be surprised. jetLookup is similar to Skyscanner but has the additional functionality of searching for flight routes with multiple stops. Want to explore Europe for 2 weeks and visit 4 cities? jetLookup just became your best friend. The downside to jetLookup is that at the moment they're only in Europe, the Middle East, and Morocco which means if you're flying from the U.S. you should get to Europe using Skyscanner and then figure out where you're headed next using jetLookup. Problem solved :). Where you can travel based on what you want to spend - that's the principle Where For is founded on. Do you have $500 and 4 days off of work? Tell Where For and they'll let you know where you can go - flights and hotels included. They'll also let you finance your trip?! Pay it off over 12 months with no additional interest (or just budget like I keep telling you...). Frankly I'm not sure it's the best tool to actually book your flights (it's better to look at a tool where there's a little more flexibility e.g. flying Friday night or Saturday morning), but it's a great tool to get a sense of how far your budget can take you! So you've made it to Europe and you know it's really easy to get around once here, but how do you compare busses, trains, and flights without having 700 tabs open on your computer? GoEuro. Select your departure and destination cities, the date you want to travel (if you're flexible you will unfortunately need a few tabs to work with) and click “search.” You'll then have one handy dandy tool telling you the cheapest, fastest, and smartest ways to get from point A to point B. So you found a cheap ticket to get you to Madrid in August. Awesome! But wait, what's the weather like? It's Spain so it'll be pretty temperate, right? It depends on if you consider 90°F / 32°C temperate. 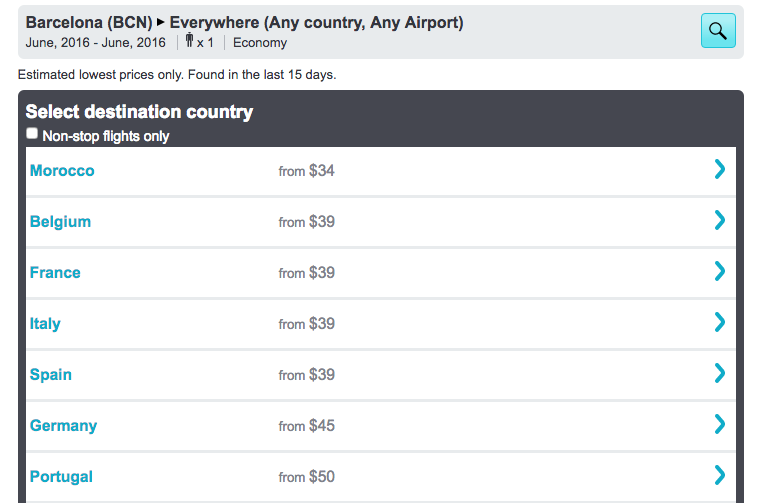 If you're searching to fly anywhere (using Where For, jetLookup, and Skyscanner) and want to check out one reason why it might be so cheap, Weather2Travel should be your first stop. Sometimes you are just getting really lucky, but other times you might be headed to Thailand during monsoon season, so do a little research to make sure you'll be soaking up the sun and not just... uh.... soaking ;). What are your favorite travel websites? Do you have a search process you always follow? Let's chat!